From thousands of guests to an intimate gathering, open to the public or by invitation only – we’ve done it all. Connect with us to see how we can deliver peace of mind and pride in a job well done. Jigsaw Events was hired by Travel Alberta to organize a multi-faceted program in NYC. The program included an event for the media, for travel industry experts, a booth at the New York Times Travel Tourism trade show, and a feet-on-the street initiative - which saw 'cowboys' take to the streets of New York City to create a buzz for an online contest to win a trip to Alberta. All of the initiatives created a unique and memorable experience which generated media hits and direct to consumer excitement about the endless possibilities that make Alberta a wonderful four-season destination. "100 million people in North America heard about the Alberta Cowboys and Travel Alberta’s key messages. To purchase the amount of media coverage we generated, it would have cost Travel Alberta $95,000. We were thrilled with the results of this campaign." Click to read about this event in Marketing Magazine! 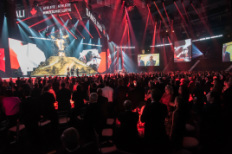 For the second year in a row, Jigsaw Events was hired to organize the Canadian Olympic Committee’s Hall of Fame Gala and Induction Ceremony. Transforming the floor of the Air Canada Centre for this premier Gala, 1300 guests who contributed $25,000 per table, were on hand to celebrate the best in Canadian sports. Working closely with partners and relying heavily on volunteer efforts to deliver an event at a cost that would reflect the most money possible for Olympic athletes and coaches, the evening raised more than $3 million dollars in proceeds to support the Canadian Olympic Team. Carolyn, you always had everything under control. You always kept your cool, and made calculated decisions. I admire you for that. It was a great experience for me to work with you. Well done Carolyn. 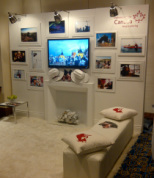 The Canadian Tourism Commission wanted to create an inviting, chic and eye-catching display that would have their presence stand out and be noticed in a room full of trade show booths. Working with the ideas and goals of CTC, Jigsaw Events worked with leading industry experts to design and create a booth to exceed these objectives. “I have had the pleasure of working directly with Carolyn and Jigsaw Events on 2 major projects. Carolyn and her team provided incredible value and were instrumental in the strategy and development of a travel trade event series, targeting key travel trade professionals in the USA and Canada. The attention to detail, professionalism and ability to service the client made every step enjoyable. Carolyn was able to work within very strict budgets and provided an array of solutions to the challenge. I would not hesitate working with Carolyn on future projects. There was a lot riding on showcasing our brand and Carolyn performed and executed amazingly”. Held at the prestigious Fairmont Royal York, this signature fundraising event for the Toronto General & Western Hospital Foundation featured a champagne reception sponsored by Veuve Clicquot, silent auction and 5-course gourmet dinner with each course paired with fine wine. The highlight of the evening for the sold out crowd of 500 was the live auction of over 100 lots of fine and rare wines. Not only a hot ticket on the Toronto social scene, the event was also a financial success exceeding expectations and raising $430,000 for the Foundation. "The evening was an amazing success and your expertise made a difference! It is with great pleasure that I thank you on behalf of the entire organizing committee for your invaluable contribution. The details of the evening, logistics, video, planning and seating were all executed with your impeccable manner. Through your leadership the evening was not only memorable but spectacular. Thank you again for your tireless contribution towards our event".